"Charlie is extremely protective over Moo. If she is unsure, she hides behind him with her head tucked under his bottom." 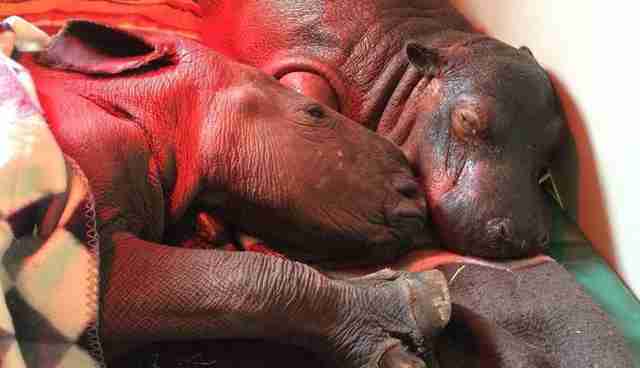 Before Charlie and Moomin met, neither of them had spent much time with other hippos. Charlie had spent most of his life with people and rhinos, while Moomin’s best friend was a sheep. 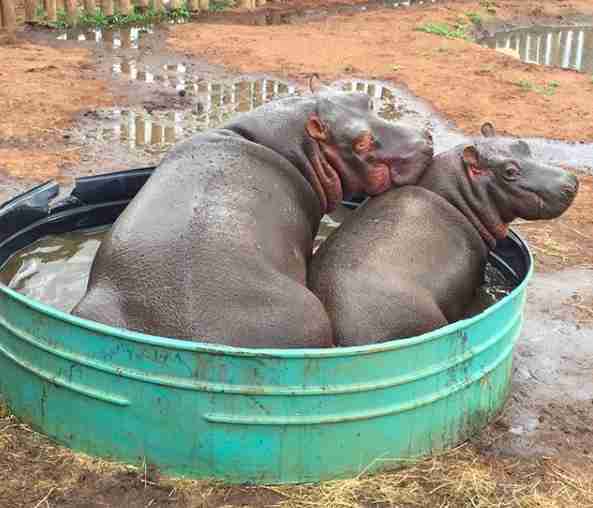 But when the two hippos met, they fell madly and deeply in love. Charlie and Moomin both had rough starts to life. When Charlie was only 2 days old, his family abandoned him in South Africa, leaving him sick and alone and vulnerable to predators. 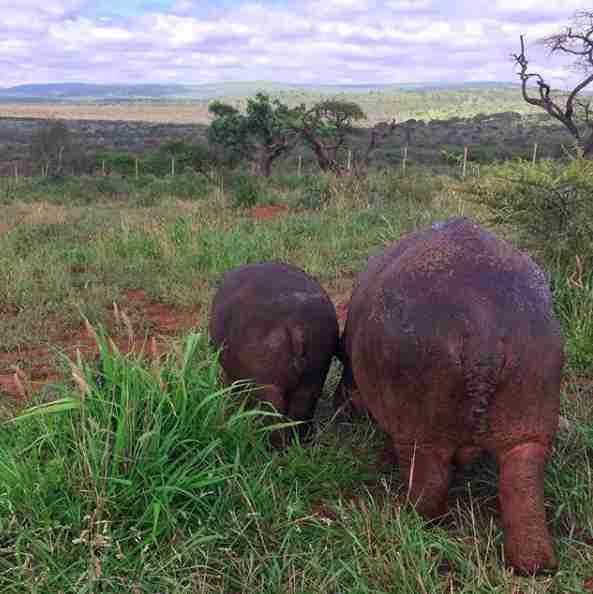 Thankfully, rescuers found Charlie before anything happened to him and delivered him to Thula Thula Rhino Orphanage. 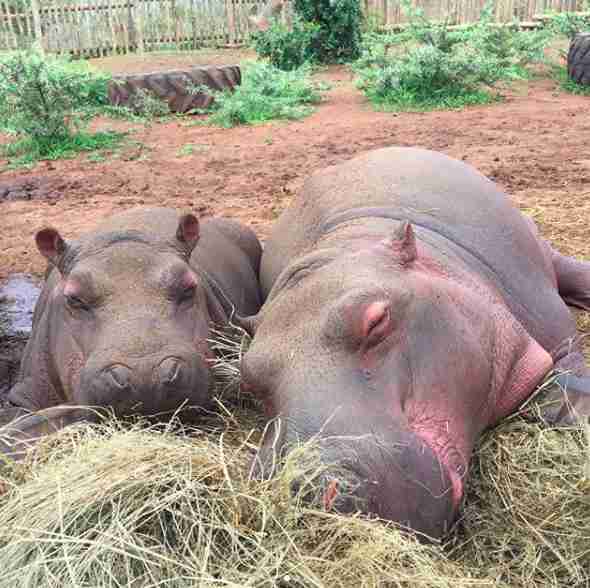 While living at the rhino orphanage, Charlie bonded with Makhosi, a young female rhino who’d also lost her family, and the two of them helped each other grow healthy and strong. 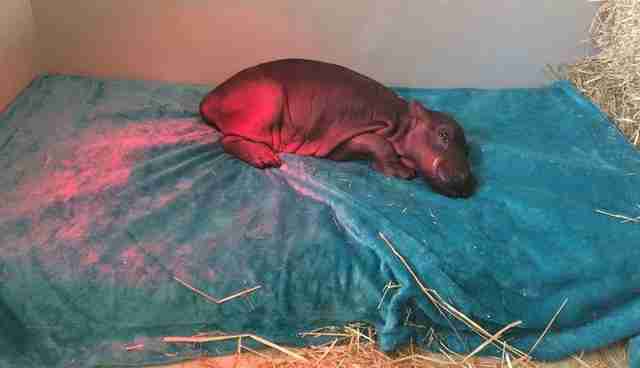 As for Moomin, she was only 3 months old when rangers found her huddled next to the body of her dead mother in the Kwandwe Private Game Reserve in South Africa. 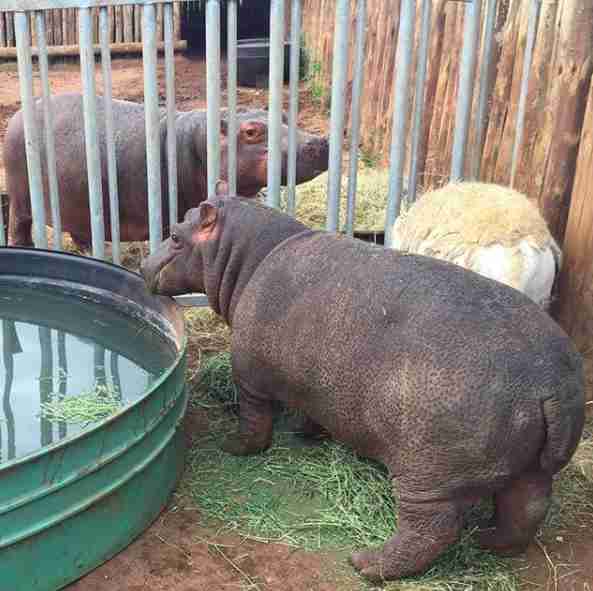 The team at Kwandwe took Moomin into their care and found her a friend, Piet the sheep. 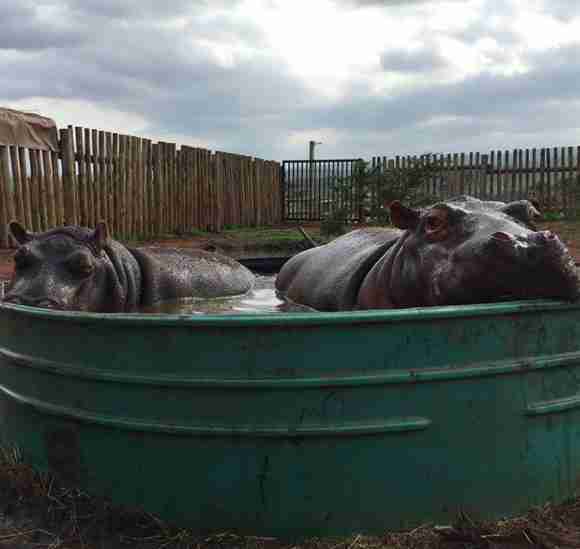 In February 2017, tragedy struck at Thula Thula Rhino Orphanage — poachers broke into the orphanage and shot two young rhinos, Impy and Gugu, who both ended up dying. 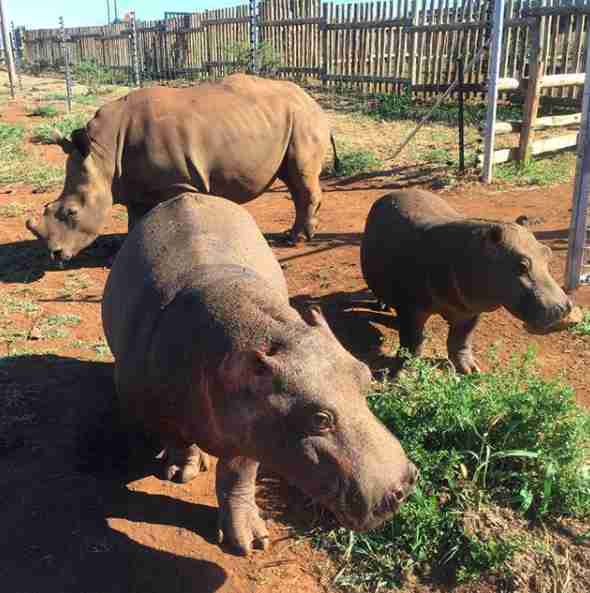 A few months after the attack, Thula Thula Rhino Orphanage permanently closed for the animals’ safety, and Charlie, Makhosi and another rhino named Isomiso moved to Zululand Rhino Orphanage. In September 2017, the team at Zululand Rhino Orphanage got a call from the rangers at Kwandwe Private Game Reserve. The rangers had heard about Charlie living there, and they wanted to know if they could move Moomin to the orphanage and set the two hippos up. 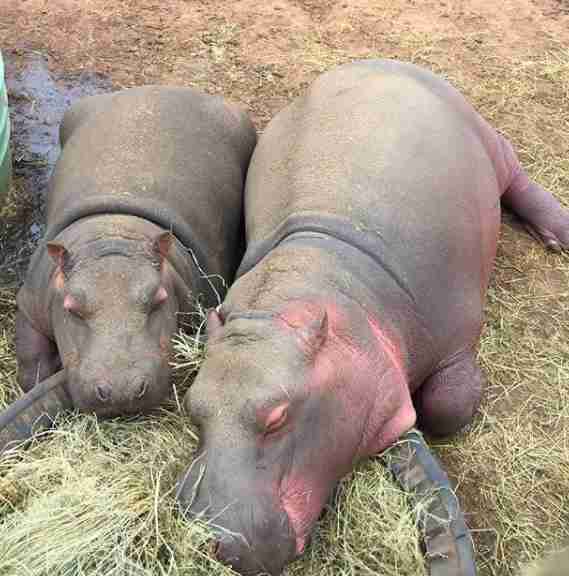 Moomin lived over 800 miles away, and Lategan and her boyfriend drove for over 40 hours to pick up Moomin and Piet and bring them back to Zululand Rhino Orphanage. But the journey was worth it. 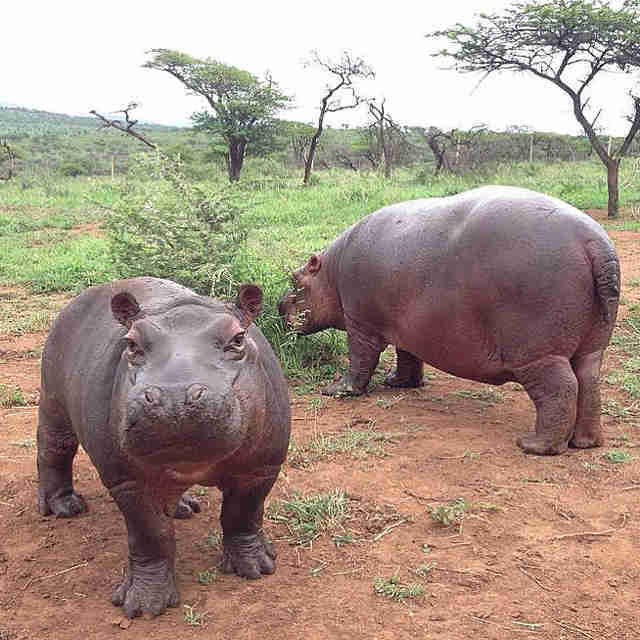 But when the moment finally came for the hippos to meet face-to-face, Charlie seemed more interested in Piet. Separating Moomin and Piet was going to be tricky — the pair hadn’t spent a moment apart for months. A friendship between Charlie and Moomin immediately started to bloom. As for Piet the sheep, he now lives on a nearby property surrounded by ewes. “He’s happy as any ram could be,” Lategan said. Charlie still has contact with Makhosi, who lives in the enclosure next to his. But now that Moomin has arrived, Charlie spends all of his time with his new hippo friend. “I absolutely love the way Moo rests her head on Charlie’s back — it’s a real comfort, ‘I am safe’ position,” Lategan added. Moomin has also taught Charlie a lot about being a hippo, according to Lategan. 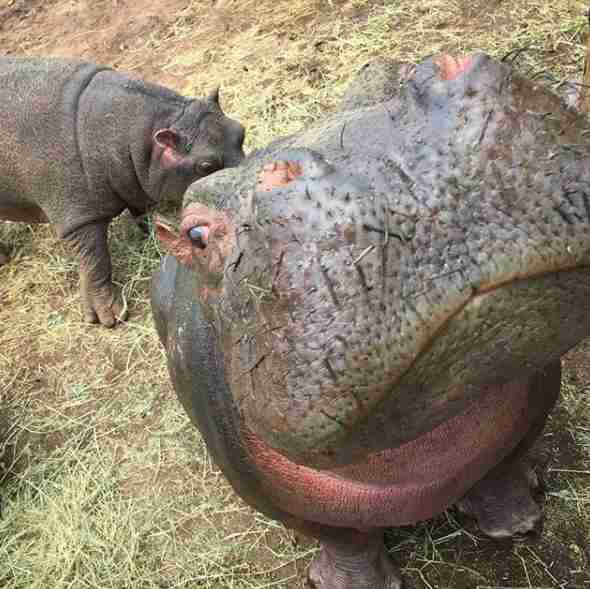 “Charlie has never been with another hippo his whole life, and Moo has taught him what it is like to be a hippo and not a rhino,” she said. 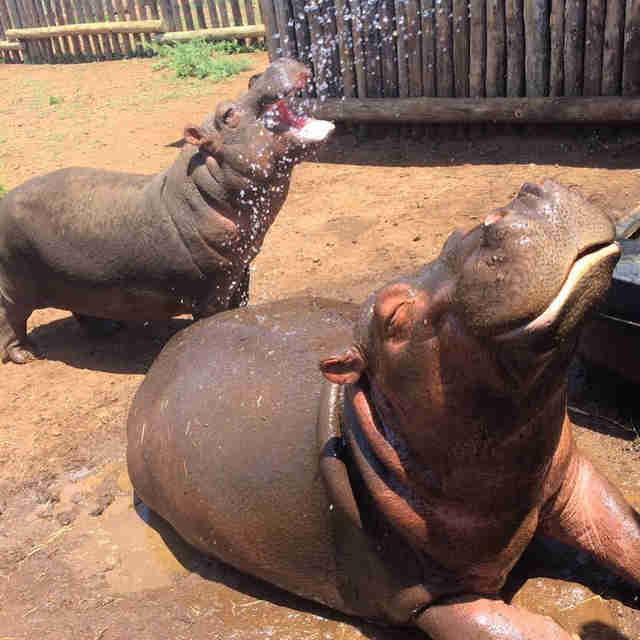 One important thing she’s taught Charlie is how to enjoy water. Not only do Charlie and Moomin spend their time together, they also constantly talk. When Charlie and Moomin are old enough, they’ll be released back into the wild. Whatever happens upon their release, Charlie and Moomin will have each other — and that’s the most important thing. 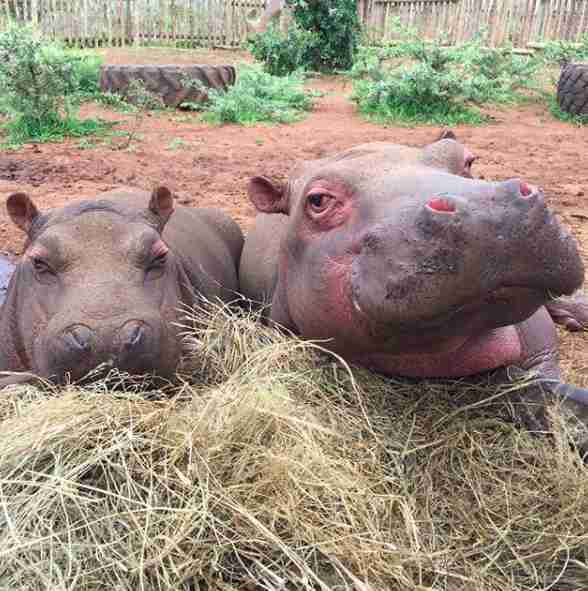 To help Charlie and Moomin return to the wild, you can make a donation to Zululand Rhino Orphanage.